Today's Bizarro is brought to you by Post-Closet Veggies. Since I like to do cartoons based on Bible stories and other common Christian myths, I have been criticized on occasion by atheists who think I am using my cartoons to advance my religious views, and praised at times by Christians who think I am trying to advance theirs. It is hard to imagine a person who would be more likely to believe in a religion because he saw it in the funny papers, but I'm sure they are out there. In truth, I'm doing neither. 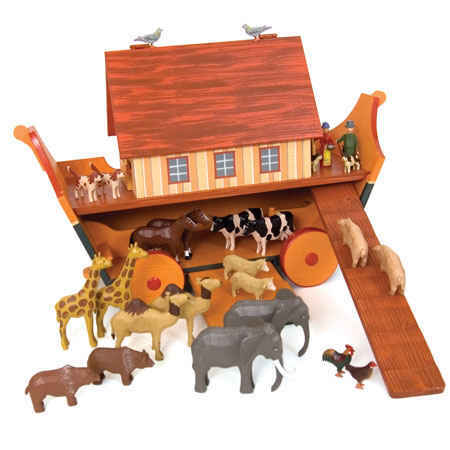 Of those who believe the story of Noah's ark is factual, some don't think about it too hard, others perform amazing feats of mental gymnastics to find logical ways in which a person could fit a breeding pair of every single species on the earth onto one boat, along with enough food to keep them all fed for who-knows-how-many months. Others just fall back on the Santa Claus Defense. The Santa Claus Defense is what parents use when their kid asks a logical question like, "How can Santa fit enough toys for every kid in the whole world into one sleigh?" The answer is always, "He's magic." Noah was magic in this same way. Among my friends in the animal rights movement, some who advocate veganism and believe in the rights of non-human animals, as I do, attempt to reach people who believe in the fundamental truth of Bible stories by finding ways in which the scriptures support the notion that man is "meant" to eat plants, not animals. If you are one of those who are motivated to try this I wish you well, but you can argue scripture with fundamentalists until you are blue in the face because in the end, you are arguing with someone who believes in magic. When that is your premise, you can make up the rules to suit your argument. I use Bible themes in cartoons because they are well known stories and, since they were written to describe common human dilemmas and traits, are great fodder for cartoons. It is the same reason I use children's fairy tales, Greek myths or famous movie monsters. Most of the time, there is no more complex reason than that. First of all I wanted to point out that God did not give humans permission to eat animals until after the flood. Before the great flood everyone was vegetarian. My church, the Seventh-Day Adventist church, advocate exactly what you described, Biblical reasons to be a vegan/vegetarian. 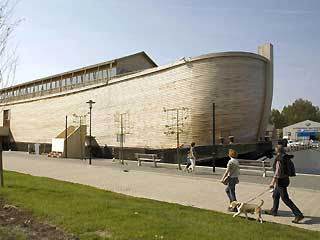 Second of all, I want to respond to you saying that Noah would have to fit 2 of every species into the ark. The word used in the Bible is kind. A Biblical kind is not analogous to a species. When you use actual science and math to determine how large the ark was, it would have been very easy for Noah to fit 2 of each kind into the ark. He only needed to do this for land animals and flying animals. Third, I would like to point out that believing in evolution requires a belief in magic. There is no known process in which matter can produce the volumes of information required for the DNA of even the simplest form of life on Earth. Not only did this have to happen once but millions of times. Also, there had to be a code system for the DNA to be coherent and make sense. This is not something random chemicals banging into each other can do. There had to be an intelligent mind behind it. And Jeremy comes in right on cue to help dan make his point. Thanks Jeremy. And obviousely you know nothing about genetics. You probably learned everything you do know from church. You probably support the use of DNA in trials and support convicting people to death because of DNA. However, DNA supports evolution. Just another case where you pick the parts you like. Wish I was a creationist, it's easy to believe in magic, and not only that, you can pick what you believe. Anyway, great comic Dan, I enjoy your posts. Jeremy, your always good for a laugh. If I remember right, and right now I'm too lazy to get up to check the Bible, people ate only plants when Adam & Eve were in the Garden of Eden. After the fall they start eating animals, killing each other, committing all the things we call sins. Franz Kafka wrote that the original sin was impatience. I think the phenomenon of adult Christians actually believing in the validity of biblical stories all the while trying to convince other rational adults that evolution (which can be demonstrated to be true with ACTUAL scientific evidence) is magic, is just an indication that we've reached (and are on the other side of) the peak of American civilization. I think we hit the peak with WWII (Hiroshima?) and have been sliding ever since. But the real "downturn" was the election of Ronald Reagan and his "magical thinking" generation. He told America that we could "have it all!" We could use up the environment because science and/or Jesus would solve our problems -- one way or another. "Star Wars" would work because he'd seen a movie (that's actually what happened by the way). Reaganomics -- tax cuts without government spending cuts --would solve all of our government woes because "the economy would mysteriously grow it's way out of those darned deficits." And don't get me started on Oprah and her magical thinking ways. America has been drinking the "magical thinking will cure all" cool-aid for decades. And now Obama seems to be ladling out more of the same. Let's just hope we don't completely devolve into a bunch of backward theocracies after China, Russia, and India get done with us. PS: "There is no known process in which matter can produce the volumes of information required for the DNA of even the simplest form of life on Earth. Not only did this have to happen once but millions of times. Also, there had to be a code system for the DNA to be coherent and make sense. This is not something random chemicals banging into each other can do." Um, at the risk of even trying to understand your logic (I'm not sure there is any) yeah, there IS a process that can produce volumes of information required for DNA -- it's called DNA. Just because you can't "imagine" it doesn't mean it can't happen. I am going to quote Jeremy's "evolutionary magic" for a long time, that is comedy GOLD!! Thanks Dan, keep them coming! @Jeremy, there is a huge difference between saying we simply haven't figured out yet how it works, and saying a super all-powerful being did it. Also, yes, random chemicals banging into each other, as you put it, is likely to eventually just accidentally manage something of exactly that sort. It's the exact way it DID happen that we're trying to figure out. As I said, I DO believe in God, so I do think there was an intelligent mind behind it. But saying it's impossible for chance to have done it, if a godless universe were assumed, is really very silly. I... I'm going to skip over the whole ark issue. There doesn't HAVE to be anything. There are a lot of amzing scientific explainations for things that are unreasonably complicated but are still able to be explained. We as people, when we dont understand something, automatically assume it must be magic. The sun rising in the morning,is magical Apollo riding his flaming chariot accross the sky. Thunder is Zues. Always magic with the Greek and Roman gods explaining nature. I feel like it's giving up. But believe what you want. doesn't bother me. @Jeremy: Cain and Abel? Why was Abel raising sheep and slaughtering them as his offerings unless he was eating them too? If he was vegetarian, and their meat was useless to him, it wouldn't be much of an offering, now would it? I love the comic and the expressions on the faces. 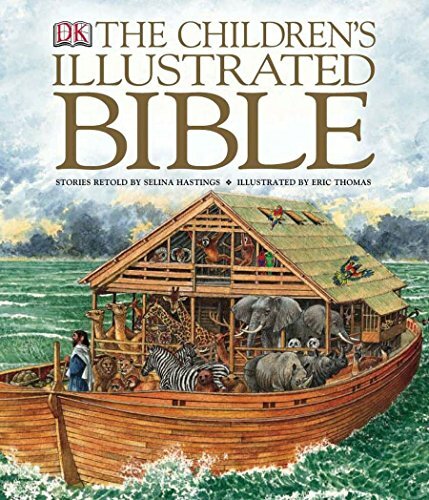 The only question I have is were there any OSHA warning labels on the ark about the dangers of lighting fires? After all if you are going to cook a large Tofudebeast for 8 hours at 350 degrees on a wooden ark you might run into problems. 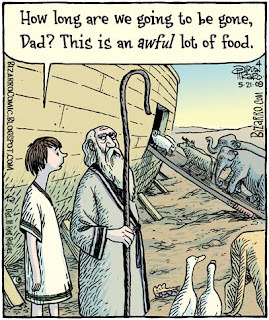 On the Ark, always wondered how they kept the lions and tigers from eating the goats and sheep(and Noah's family/friends). Must have had some mighty big cages, I guess. Or maybe the animals were all vegetarians back in the good old days. DummyMoose said: "The sun rising in the morning,is magical Apollo riding his flaming chariot accross the sky. Thunder is Zues." Damn right! It's good to see that old-time religion, misspellings and all, is still observed by some, even in these godless times. As a forgotten sage once said, "Primitive people believed that the sun sailed around the earth in a boat, and a pig ate the moon every four weeks. This was known as the Wisdom of the Ancients." The accidental origin of simple life billions of years ago is not a testable scientific idea. And even if scientists were able to prove that life could have evolved (under some extremely chancy scenario), would that mean it actually had? Accepting such a scenario would take no less faith than accepting that an omnipotent god created the world, as recorded in Genesis. http://www.youtube.com/watch?v=ZQRc8OtFUscthanks for your time! peace.